Implementing LEAN in any organization requires an understanding of the dynamics of change, how they affect individuals in the organization and an ability to translate vision into terms people can understand and buy into. 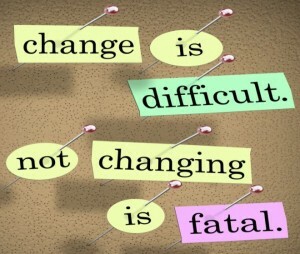 There is a misconception today that people are resistant to change. People are not resistant to change. People are resistant to being changed. They don’t want to embark on any new initiative unless they fully understand it and see the benefits it brings. It is our job as managers to help them in this discovery process, answering their questions, constantly describing the advantages of the change, explaining the individual’s role and the changed organization at the end of the process. You can not over communicate change. You can not talk too much about change. You can not over encourage people to participate in the process of change. If we don’t do this, people will resist change. This is especially important in organization that is in the process of becoming LEAN. The LEAN process is a process of continuous change. To successfully implement LEAN we need to empower everyone to take what ever action necessary to improve processes. We also need to hold everyone accountable for making changes. There are three distinct phases of change. The first is starting on the journey. This starts when the decision. To change is made. The third is a new beginning, some point in the future when the new culture emerges. The middle phase is the transition phase. This is the most exciting phase of change. There are no rules in this phase. We can try anything. If it works and benefits the customer, we implement and hardware it. If it doesn’t, we make adjustments, if it still doesn’t, we scrap it and try something new. In order to be successful we need an empowered accountable organization willing to try. If we don’t prepare the organization properly and support it in the transition phase, it will not be successful.